Looking for a new career? Want to earn extra money? Learn to Perform Wedding Ceremonies & Become a Certified Ordained Officiant. Start your own business; enhance your resume. Learn everything to help prepare you to confidently perform a wedding ceremony. 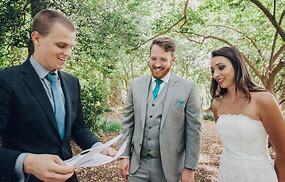 Step-by-step instruction to ensuring each wedding you perform is legally binding. Receive hands-on training; how to get clients, ordination, consultations, pre- wedding rehearsal, preparation of wedding vows; Traditional, Contemporary, Civil, Interfaith, Vow Renewal ceremony services, submission of wedding documents/license to county, fees and fees for travel, and much more. Get great tips on marketing your business. Learn all this and more in this one-day seminar. The average Wedding Ceremony is less than 15 minutes, the average rate for performing a wedding ceremony is $375-650. Take this class today, Perform your first Wedding Tomorrow.